The trail up the Bear River mainly followed the route of the present wagon road as far as the upper side of Bear River canyon, where a ford lead to the west side of the river, and the trail continued up on that side. 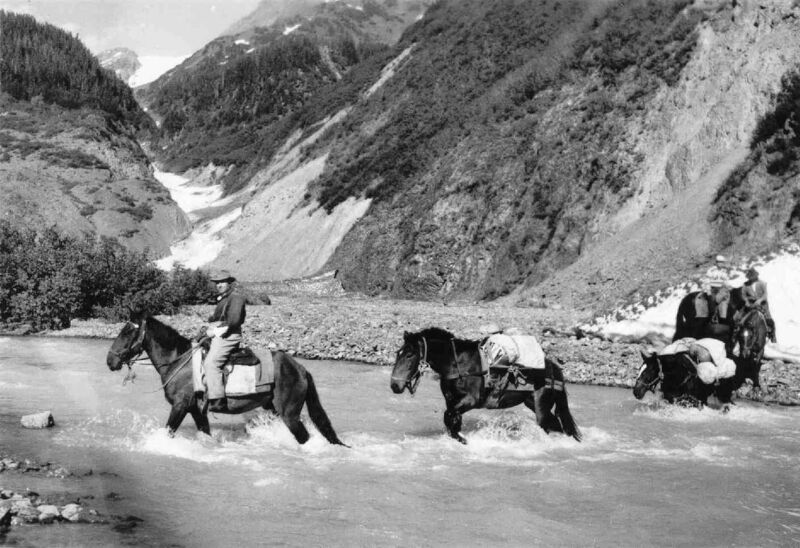 Frequently high water in the river prevented the ford being used for days at a time, and on several occasions, returning prospectors were marooned with little or nothing to eat until the water subsided. Goose Camp on the west side of the ford got it’s name from a lucky shot with a 30-30 that brought down a goose to two hungry prospectors and provided the first meal in two days. Wolf Camp about a mile beyond Glacier Creek, was a stopping place, where, in the winter of 1903-04, a band of wolves stampeded Rainey’s horses, one of which was killed. Wolves at that time were fairly numerous during the wintertime, especially in the neighborhood of the tide flats, where they preyed on the waterfowl hunting the sloughs there. Muddy Gulch, at the north end of Bear Lake was a quagmire during the wet weather, and Hell Hill was a steeper continuation of the same conditions. The mud was deep and tenacious and in later years caused many difficulties in the construction of the wagon road.